This Chevy Camaro is a perfect blend of its classic heritage with modern technology and engineering with spectacular performance to boot. 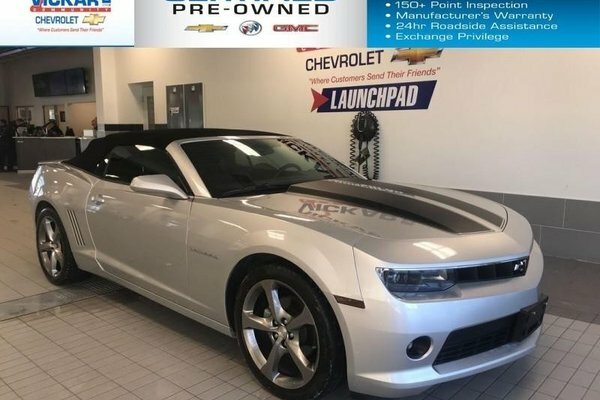 This 2014 Chevrolet Camaro is for sale today in Winnipeg. For tire-burning power and Hollywood looks, it doesn't get much better than the 2014 Chevrolet Camaro. For the 2014 Chevrolet Camaro, you'll instantly spot the car's sleeker front grille, new headlights and taillights, and minor changes all around. But the return of the Z/28 moniker adds a whole new level to Camaro performance this year.This low mileage convertible has just 32447 kms. It's silver in colour. It has an automatic transmission and is powered by a 3.6L V6 24V GDI DOHC engine. It may have some remaining factory warranty, please check with dealer for details. Buy this vehicle now for the lowest bi-weekly payment of $198.24 with $0 down for 72 months @ 6.24% APR O.A.C. ( Plus applicable taxes - ). See dealer for details.